It took three tries to get this recipe right. 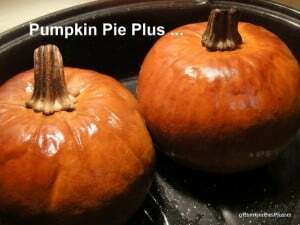 I wanted a new entry for my ongoing Pumpkin Pie Plus … series. What I had in mind was pumpkin with chocolate in bar or brownie form, namely Pumpkin Butter Chocolate Brownies. But adding even a small amount of cocoa overpowered the pumpkin the first two times I tried and made for almost a bitter baked good. Solution? Make the bar more like a chocolate chip cookie so that the chocolate complements the pumpkin and other ingredients versus overwhelms them. The result? Pumpkin Butter Pecan Chocolate Chip Bars. I started out with the idea to use Kelly’s amazing Flourless Brownies using my pumpkin butter instead of the required nut and/or sun butter. But I ended up using a bar variation of my Brown Sugar Chocolate Chip Cookies as the basis for my recipe. Oh, and while I really wanted to use pumpkin butter totally in lieu of eggs, my mixtures were coming out far too wet and I just couldn’t make an egg-free, vegan version happen in the allotted time. This last version—the successful one shown—came together when Mr. GFE and I arrived home from camping and I had 45 minutes to “create” before we were due at a cousins’ crab feast. Under pressure, I went with what suddenly made sense and it worked. Everyone loved these bars and one cousin proclaimed “without a doubt, your best recipe ever!” I gratefully accepted that compliment. These bars have a great undertone of pumpkin with just enough spice, a lovely texture provided by the almond flour and chopped pecans, just the right amount of mouth feel from the coconut oil, and finally everything that those always beloved chocolate chips add to any recipe. So these bars are definitely winners! Despite photos taken “on the run,” I hope you can still see how beautiful and scrumptious these bars are. They are also the perfect entries for this month’s Go Ahead Honey, It’s Gluten Free! event with the theme of Spiced Desserts (hosted by Noosh of For the Love of Food), Linda’s Gluten-Free Wednesdays (monthly challenge: Create a Recipe Using Squash), and Kelly’s Our Spunky Holiday. As these are gluten free, grain free, dairy free, and refined sugar free (when made without chocolate chips), these even would have been terrific for the Paleo Parents’ (now Real Everything) Healthy Halloween Recipe Roundup, but I missed the deadline. Boo, indeed! But that’s no reason for you to miss out on the fun … you can see their great roundup here before you check out my Pumpkin Butter Pecan Chocolate Chip Bars. These bars are rich and delicious and on the healthier side because of the use of ingredients like almond flour, coconut oil, and pumpkin butter. Add coconut sugar to large bowl. Stir in coconut oil. Stir in eggs, pumpkin butter, and vanilla extract. Mix well. Add almond flour, baking soda, salt, pecans, and chocolate chips, mixing until you have an even batter. Using spatula, spread mixture into lightly greased 9 x 13 baking pan. Bake for about 20 minutes or so. Check for doneness using a toothpick. Cool in pan at least 15 minutes before cutting. Ghirardelli Semi-Sweet Chocolate Chips are dairy free by ingredients but be advised that the label now states that they are made on the same equipment as milk products. Enjoy Life Mini Chocolate Chips and Mega Chunks are dairy free and made with evaporated cane juice. Enjoy Life's Dark Chocolate Morsels are my new favorite. They only contain two ingredients--unsweetened chocolate and cane sugar. Enjoy Life products are also grain free. If you like wet and moist bars, you may want to use more coconut oil. Add one tablespoon of coconut oil more at a time until you get a really spreadable batter. Omit chocolate chips or use cacao nibs for a completely sugar free option. I lowered the sugar a tad for this recipe; if you like sweet, you may wish to increase the amount, but with the already sweetened pumpkin butter, the chocolate chips, and the natural sweetness of coconut sugar and pecans, we found this amount to be about right. For you I’ll edit the post, no problem! Good food is worth the time it takes! REALLY wanna try these! Yaay, a photo in the feed! And this looks delicious. Hi Kalyn–Thanks so much! I must admit it’s pretty cool to see the photos there now. Unfortunately, I think that addition might have broken my print capability. The two don’t seem related, but they hapended at the exact same time. 😉 Must wait for my web person to get back into town and do her magic. These look so delightful Shirley!!! Are they as moist as they look?? Your ingredients are great. One thing…your “see recipe here” (for pumpkin butter) link doesn’t look active? Hi Amber–Thanks! Yes, they are quite moist, BUT in the recipe here I backed down on the coconut oil some as the bars did leave a bit of a grease impression on the napkin. If you make these and the batter looks dry, add a bit more coconut oil … maybe a tablespoon to begin with. I think there will be some variations per individual recipes based on how dense/wet one’s pumpkin butter is, too. Thanks for the heads up on the missing link! I should make a rule never to have multiple links in my posts. I included the link in the first reference, but totally missed the second one as in my mind, I had already linked the recipe. OMG, these look so awesome!! I can’t wait to try them! I make my own “candy” each year for my kids around the most popular candy holidays. I just couldn’t decide which ones to add this year, so I went with lucky #3. I’m totally addicted to Karina’s rice crispy treats (I’ve made them about 10 times) and I thought chocolate would be a winning combination. It was! You have a good night Shirley! oh, wow, Shirley, I can almost taste these… they look and sound SO good! Hi Felicia–Sounds like you are primed to make these bars then! 🙂 FYI–I did add a note to the recipe stating that those who like really moist bars might want to add a little more coconut oil. Oh wow, recipe event madness! Either way, these bars look amazing Shirley! They’re reminding me that I really should make some pumpkin butter this year. I’ve never made pumpkin butter before, so I think I just found my challenge for Adopt a GF Blogger! 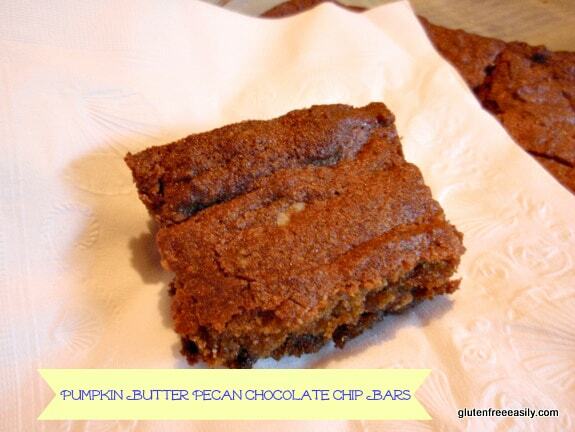 Pumpkin Butter AND these amazing Pumpkin Bars! I’m so excited to have the opportunity to adopt you! Hey Heather–OMG, you are adopting me??!! I am so excited and worried … I always worry when people adopt me. 😉 But I think you will love both of these. As I’ve been replying to everyone, if you like moist, see the note I added to the recipe about possibly adding more coconut oil. These really do catch my fancy. I really will make these soon. What a shame it’s spring and I have to buy a pumpkin when I have so many just starting to grow in the garden. I kid you not, I pulled up over 100 self seeded ‘rouge’ pumpkin seedlings already this week! Hi Maggie–You’re such a dear–thank you! Oh, I’d love to be on the way to your house for a party! Mr. GFE would enjoy it, too. 🙂 One day we’ll make it to your neck of the woods for sure. Wow! Chocolate and Pumpkin. I would have never thought to mix the two. I can’t wait to try to make them. Mmm mmm mmm! Hi Meg–It looks like you are new here—welcome! 🙂 While I had read about folks combining chocolate and pumpkin and I’ve made pumpkin chocolate chip cookies that we love, in my first two attemtps to make bars using cocoa, the chocolate overpowered the pumpkin. But in this recipe, the chocolate chips are just the right amount to complement the pumpkin. So chocolate chips are the answer to combining chocolate and pumpkin. Hope you love it! Shirley, these bars look great, and I love that you used almond flour and made them grain free. Did you know that you don’t have links for the three events you are submitting this to? I only say that because I have not kept up this month and don’t even know who is hosting Go Ahead Honey, so I wanted to click on it, but there is no link. Again, those bars look terrific! Hey Linda–Yes, I knew. I just wanted to get the post up and go back and find the links later. Most of them are just the announcements posts and I wasn’t entirely sure about Go Ahead Honey this month either. I just knew the theme from reading elsewhere. Plus, I was “on the run” getting ready to fly cross country for a girlfreind get together. All the links should be updated now (at least to what’s available). 🙂 Noosh of For the Love of Food! is hosting. Read more here. These look fantastic, can’t wait to try them! Hi Melanie–Thank you, dear! 🙂 Note that I did go back and make a few extra notes in the recipe to ensure success for all, so take a look before you bake. These look absolutely incredible, Shirley! I haven’t tasted them, but I’m willing to bet they were worth all of the trial and error to come up with such an amazing end result. I love that they are grain-free and sweetened with coconut sugar, too. Yum! These look awesome! Unfortunately I will not be able to make the pumpkin butter for the recipe at this time. Do you think I could add sugar and spices to canned pumpkin to make it work? Hi Joan–Thank you! I expected someone to ask the question on pumpkin puree vs pumpkin butter. I am *guessing* that if you use pumpkin puree, additional spices, and additional sugar, that this recipe will work but become more cake like because you won’t have the pumpkin butter density. But give it a try and let us know! These look wonderful! Anything with pumpkin and spice has me hooked..I must go back and check out that pumpkin butter recipe! Two of the worlds most delicious foods–together! As they should be, ha ha! I absolutely adore the combination of pumpkin and chocolate. And this paleo version sounds just great. I’m glad you persisted and came up with the perfect bar! Oh my, Shirley! This combination could not be any more perfect! I wish you could be delivering me some on a plate right now!! I am thinking that these need to be made TODAY! 😉 The third try was definitely the trick for these! Oh Shirley, you are singing my song. I would love these. Must make. Oh man. Those look so freakin’ good. Mmmm…… The kiddo loves pumpkin, and has been asking me to bake something new. Hm…may have a project for this afternoon. I bet they would work with apple butter, too. Thanks, Deanna! I consider “freakin’ good” a high compliment. 😉 I hope you and the kiddo enjoy these if you get to make them. And I believe this recipe would indeed be great with apple butter vs pumpkin butter. In fact, the gals and I couldn’t find pumpkin butter at the natural food store this weekend, so we picked up some apple butter to try that alternative. Unfortunately, we ran out of time to make all the goodies that we wanted! These look delicious!! Thanks for the recipe. Those look scrumptious! I have to try them. I love this time of year just so I can eat pumpkin EVERYTHING! Hi Sea–Thanks! They are scrumptious. 🙂 If I had some pumpkin butter made, I’d make these today so I could have some for my flight to Dallas. 😉 And I never turn down gf pumpkin goodness, but pumpkin is more available this time of year. Shirley, those look absolutely delicious! Like a pumpkin brownie. Love all the healthy ingredients you used too – who says Halloween can’t be healthy? My kids and I made these together. They were skeptical, but WOW! I can’t believe how wonderful the texture is! We miss our old Pumpkin Muffins from back in our gluten days (I even entered them in the state fair one year) and have been looking for something to give us that satisfaction in a grain free way. This goes above and beyond everything else we’ve tried so far. Thanks!!! Hi Julie–Welcome to gfe! 🙂 I’m absolutely thrilled that you and your family loved this recipe so much! 🙂 Thank you so much for taking the time to leave this wonderful comment. I hope you find many more super pleasing grain-free recipes on gfe. 😉 Off to share your comment on Facebook so that others will be reminded of this recipe. Readers tend to forgot about pumpkin during the summer, but I love it year round. Oh, and I’ve also made subbed cooked, mashed sweet potato for the pumpkin in this recipe and it’s just as yummy! be able to eat this. Is there another alternative? Hi Erna–Welcome to gfe! 🙂 Honestly, I’ve only made this recipe with my homemade pumpkin butter. Other readers have asked about using pumpkin puree, but although that *might” work in this recipe, it would yield different results, not these thick rick bars. It sounds like your best option would be purchasing a small jar of ready-made pumpkin butter, or even apple butter, to make this recipe. Good luck, and please report back to tell us what you try and how it works out! 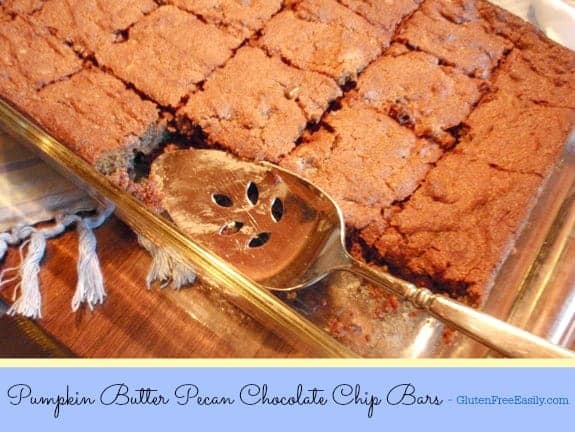 Your Pumpkin Butter Pecan Chocolate Chip Bars look delicious, Shirley. I love how allergy friendly they are and they are perfect for fall! Pinned and will tweet. Thank you for sharing them with us at the Hearth and Soul Hop. Thanks for all your sharing as always, April! I happen to have some homemade pumpkin butter ready so I’ll be making these again soon. These bars surprise me anew each time I make them. So full of deliciousness!